Minuteman maple leaf andirons are black powder coated. 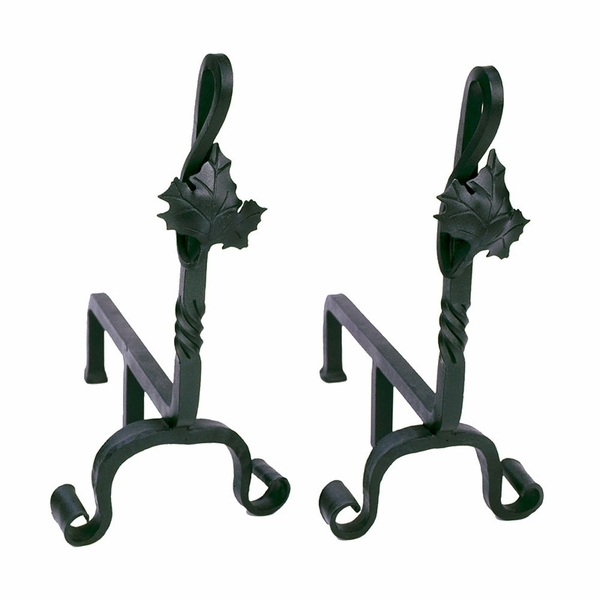 Crafted from durable wrought iron, these gorgeous fireplace additions add elegance to any room. Position them closely together for short pieces of wood or further apart for longer lengths. These fit virtually any fireplace. A matching pair makes a thoughtful gift as a house warming present; buy them for yourself as a beautiful accessory to blend with any decor. The appearance of these andirons is quite rustic but still attractive. They are well built and seem to be very durable. I want to keep my fires going the colonial way, and these andirons are the perfect tool to help me do just that. They are very sturdy and have a nice appearance. They are just right for anyone who prefers to use the fire-starting methods of the early settlers.